These can help stimulate “the natural emotions of love, awe, and gratitude.” While this collection is primarily aimed at Unitarian Universalist families with children, many of the resources are aimed at families with adults only. To the best of my knowledge, all the material on this page is either in the public domain, or available for non-commercial use (e.g., the Unitarian Universalist principles, which the copyright holder grants permission to copy for non-commercial purposes). I hope this small collection helps you to bring your Unitarian Universalism into your home. Some families set aside time to be together towards the end of each week, perhaps on Friday evening, or perhaps on Sunday evening before dinner. These are good times to pause and catch your breath as a family, while you light a candle or a flaming chalice. You could use the readings below as you light the flame. The light of the ages has brought wisdom and truth to all peoples, in all times of human history. We light this flame to remind us to seek wisdom in our own time. We light this chalice to remember that life is born again every day. Encendemos este cáliz como recuerdo de que la vida nace de nuevo cada día. La Sociedad Unitaria Universalista de España (Unitarian Universalist Society of Spain). So may the spirit of this chalice bless us with truth, life, and love. Derek McCullough, Australian and New Zealand Unitarian Association. A religion that offers hope that we can make the world better. These are words you can use to offer thanks before starting your meal. Based on an ancient Jewish prayer. Let us thank (her) (him) (them) for our food. Hold hands around the table. Ask everyone at the table to say one thing he or she is thankful for that day. 15 – 20 seconds of silence is about right (depending on the ages of children who are present). The principles of the Unitarian Universalist Association are included here for the reference of adults and teenagers (in my experience, younger children do not find them meaningful or comprehensible, and merely recite them without really knowing their meaning). I’ve also included some other affirmations of faith used by Unitarian Universalists. And hands that are ready to serve! Based on words by Ginger Luke. Be ours this day and in all the days to come. I will strive toward high ethical and moral standards in my personal life and in my life in the wider community. I will work for the understanding and promotion of a religion of love, assuming a spirit of cooperation and tolerance towards other religious groups. I will commit myself to keep formulating my own religious beliefs according to my individual needs, the needs of the world around me, my conscience, and my degree of maturity. From First Unitarian Church, New Bedford, Mass. Many people find words especially helpful in expressing their religious identity, and in guiding their religious journey. These poems and short readings can serve as prayers for all ages. In a personal note, as a Unitarian Universalist young person, I learned both “Look to This Day” and “Renew Yourself” in early adolescence, and these were short sayings or prayers that I consciously recited through my college years and beyond. You never know what young people will hold on to as they get older. Rev. Edward E. Hale, Unitarian minister. Lead us from death to life, from lies to truth. your name is goodness and holiness. just as I feel your love in my heart. grant all people the food they need today. help me forgive those who fail me. may your love watch over me, and over us all. A traditional Jewish prayer, adapted by early Christian communities, and further adapted by Dan Harper. I will be of good-will to all people. Ancient Sanskrit source, from The Beacon Song and Service Book, an old Unitarian hymnal for young people. Renew yourself completely each day. Adapted from the Christian and Hebrew scriptures. Meditations are longer readings, including poems, excerpts from prose works, and passages from the scriptures of the world’s religions, that help us focus on what it highest and best in life. Poems often works especially well as meditations. Two short poems are reproduced here, then links to a number of copyrighted poems. The same stream of life that runs through my veins night and day runs through the world, and dances in rhythmic measure. It is the same life that shoots in joy through the dust of the earth in numberless blades of grass, and breaks into tumultuous waves of leaves and flowers. It is the same life that is rocked in the ocean-cradle of birth and of death, in ebb and flow. In addition to the meditations below, there are many excellent poems which can serve as meditations on a variety of important topics. The following copyrighted poems could serve as meditations, and many of them address powerful topics such as justice, the purpose of God (if any), and the meaning of life. These poems are most suitable for older teens and adults. “God” by Langston Hughes, which says it might be better to be human than to be God. “I’m Not a Religious Person But” by Chen Chen, a meditation on pop culture and religion. “In California: Morning, Evening, Late January” by Denise Levertov, an ecojustice poem. Michael Symmons Roberts, a poem about climate change (recommended by a high school-aged youth). “my dream about being white” by Lucille Clifton, a brief but powerful meditation on race. Many of Clifton’s poems make excellent meditations; more of her poems. “Sanctuary” by Jimmy Santiago Baca, a poem about immigration. “Thank You” by Ross Gay, a poem of gratitude (but not easy gratitude). It’s a good idea for children to learn how to do silent meditation. While a regular practice of silent meditation is not for everyone, knowing how to meditate in silence is a skill every Unitarian Universalist child (and adult) should learn. Meditation is a great way to become more calm and centered, to become more who you are. It’s not the only way to accomplish these things, but it’s one of the simplest. If you are an adult who wants to teach the young people in your life to do silent meditation, one of the best strategies is to take the time to have your own silent meditation practice. By doing it yourself, you set a good example, and you can better help others as they learn how to sit in stillness and quiet. Adults and youth who want to learn a simple meditation technique can read The Relaxation Response by Herbert Benson. For use in the home, especially with younger children. Light a candle (or a flaming chalice), perhaps using some of the words for lighting a chalice (see above), and then just sit in silence for two or more minutes watching the candle flame. (If you light a small candle like a birthday candle, you can watch it until it burns all the way down). Often even young fidgety children who resist the idea of silent meditation will like this practice. Collect some natural objects, such as pretty stones, dried leaves of grasses, flowers, pine cones, etc. Ask the child/ren to take one of these natural objects, one that appeals to them, and hold it in their hands; look at every detail; you don’t have to think of anything else. Then sit in silence for 1-2 minutes while they look. Eventually, you can work up to longer times. When weather permits, this kind of meditation works even better outdoors. When you’re outdoors, children can look around for their own natural object. Alternatively, you can have them listen to all the sounds of the outdoors, and at the end of your time of silence you can share all the sounds you heard (wind in the trees, birds, cars, perhaps animals, etc.). Or you can lie at the foot of a big tree and gaze up into its branches for a time of silence, as yet another form of outdoor meditation. Singing is a wonderful spiritual practice to do with children. The simplest way to do this is to sing songs that you know well. But if you’d like to learn some new songs, here are two sources. First of all, the Unitarian Universalist hymnal, Singing the Living Tradition, is a good source for songs. And another good source for songs is the popular songbook Rise Up Singing. The Rise Up Singing songbook has guitar chords (if you play guitar); best of all, there are YouTube videos for many of the songs in Rise Up Singing. However, Rise Up Singing has more traditionally Christian words for some of these songs, so I like to look at the words in Singing the Living Tradition. Here are a few songs contained in both Singing the Living Tradition (SLT) and Rise Up Singing (RUS) that are fun to sing with kids. For families who want to connect more with the rhythm of the seasons, such as families with neo-pagan leanings, and/or families committed to eco-justice, seasonal meditations can help you focus on what’s going on around you. But the wheel of the year is different depending on where you live. Look for poems written by poets who live in your area — that way, if you live in the Bay Area of California, your winter readings will be about the rainy season, not about snowfall and frozen ground. Better yet, you could write your own seasonal meditations. Below are some examples of seasonal meditations that I wrote: the first group is for central New England, and the second group is for the Peninsula in the Bay Area, California. a landscape stripped to essentials. fairy tales. It is winter reality. the sun higher in the sky at mid-day. buckets appear on sugar maples; snow melts. you can see little bits of it. the owls call out, searching for mates. winter’s as good as over. It’s not. But now you can feel hopeful. it sheds enough light to see clearly. in that stillness where dreams begin. the sun never gets very high above the horizon. are bare, except for a few stubborn oaks. by now, it’s too late. Give up for the year! more. Sit in idleness. Stare at long shadows. are meant to be used. We were awakened in the middle of the night by the smell of smoke. We got up in the dark. Our building was not on fire. Where was the smell was coming from? Maybe the neighbors left a fire burning in their fireplace overnight, and the slight breeze blew it into our house? The next morning we heard that thousands of acres were burning 70 miles north of us; the smoke we smelled was from those fires. Tonight the light was rosy with a yellow tinge. I went up to where you can look out at San Francisco Airport, and watched a couple of jetliners land. A bank of fog stretched from the Golden Gate across the Bay towards Oakland; an avalanche of fog curled over the top of San Bruno Mountain; the fog was several hundred feet above me, pushed upwards as it moved through Crystal Springs Gap. A pair of White-tailed Kites hovered overhead, silhouetted against the bright low clouds; they worked their way down the hill, coming to a hover every minute or so, until they disappeared behind some trees. The rosy glow from the sunset really was lovely, even knowing that lovely redness came from wildfire smoke. We walked down to the edge of the water. The hills across the bay are now a soft green. The setting sun glinted off windows of houses far up in the Oakland hills. And a beautiful golden haze hung over the waters of the bay. It’s the golden haze again. This is how it’s been for the past week: cold, still air has settled down over the area, trapping pollutants in the wide bowl formed by the mountains surrounding the bay. The people who monitor air pollution say the air quality is “unhealthy” because they have been detecting high levels of fine particles. That’s what has caused the golden haze. “It’s beautiful,” we said to each other. We kept walking, watching the shorebirds, and the play of light on the water. Carol turned the car into a roadside fruit stand. Some of the apricot trees hung over the parking area, and the owner of the stand charged just fifty cents a pound for fruit we picked from the parking lot. We took home ten or fifteen pounds of apricots, and the kitchen was taken over by jam-making. On the counter near the stove were pectin, canning jars, jar lids, and bags of sugar. On the stove sat a big pot for cooking fruit and another big pot for sterilizing jars. On the counter on the other side of the sink was the big bag of fruit waiting to be processed. Before long, all that fruit had been cooked into jam. But apricot season wasn’t over yet, and Carol got more cheap apricots at the farmer’s market, and made more jam. Jars full of deep orange apricot jam sat cooling on the kitchen counter, and every once in a while one would make a little “tink” sound as the lid sealed into place. Apricot season will soon come to an end. Soon there will be no more bowls full of apricot pits in the kitchen, waiting to be put on the compost pile; there will be no more jars cooling on the counter, and no more “tink” sounds at unexpectedly moments; no more orange drips of jam in odd places. The kitchen will return to normal. Three dozen jars of jam will sit quietly in the kitchen closet waiting to be given away and eaten. And we’ll wait for apricot season to return again next year. I came vaguely awake early this morning as a city bus turned the corner at the traffic light below our bedroom. The summertime fog had returned at last. The light was dim and diffuse, and I knew that the fog was hanging a few hundred feet over the city, blocking the sun. The cold water was welling up from the depths of the Pacific on the other side of the Coastal Range, once again making a huge fog bank in the early morning. The growing warmth inland heats the air over the Central Valley, and draws the fog through the passes. 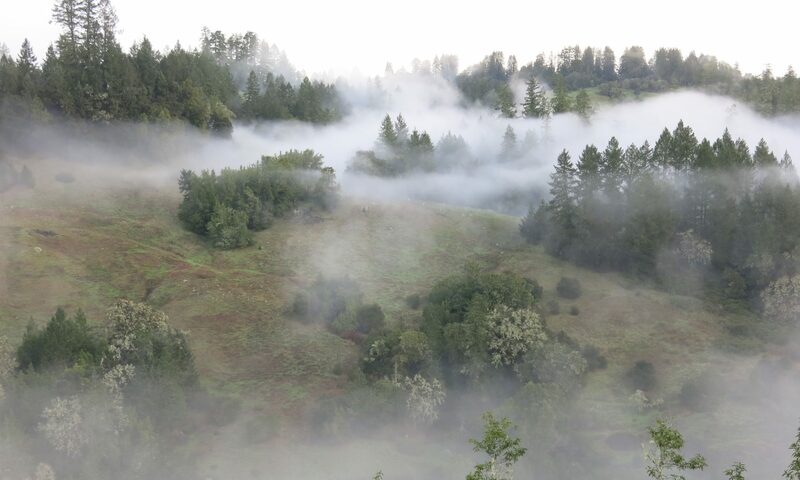 On the coast side of the hills to the west, the fog lies at ground level, but is pushed up by the Coastal Range to form low clouds. The city is cool and gray and dim and delightful. By mid-day, the sun will burn the fog away, revealing once again the relentless summertime sunshine. But tomorrow morning will again be dim and cool.